New Canaan is a town in Fairfield County situated about 48 miles from New York City. It has a population of about 20,000 and consistently ranks among the wealthiest cities in the United States. In 2013, New Canaan ranked fifth on CNN Money's list of top-earning places in the U.S. In 2008, the town had the highest median household income of any city in the country. New Canaan has a total area of 22.5 square miles. It borders the New York towns of Pound Ridge and Lewisboro and Wilton, Norwalk, Darien, and Stamford in Connecticut. New Canaan is divided into several sections including Ponus, Smith Ridge Road, Pinneys Corners, Silvermine, New Canaan Center and Talmadge Hill. Two points of interest in New Canaan include Waveny Park and New Canaan Nature Center. There are also several notable places on the Nation Register of Historic Places such as Landis Gores House, John Rogers Studio, Hanford Davenport House, and the Hampton Inn. New Canaan's public schools are considered one of the best in Connecticut and the United States. There are three elementary schools, one middle school and one high school. Nearby private schools include St. Aloysius School and New Canaan Country School. On weekdays, New Canaan has several scheduled express trains to New York's Grand Central Terminal. The fastest train to New York during the morning commute takes just 66 minutes. Connecticut Department of Education's District Profile And Performance Report for New Canaan. Connecticut Economic Resource Center's Town Profiles. Want to find out more about New Canaan? 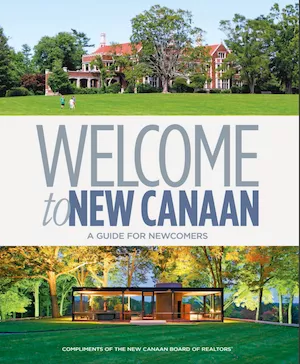 Click here to download your FREE copy of "Welcome to New Canaan: A Guide For Newcomers." Courtesy of the New Canaan Board of REALTORS®. Updated:25th April, 2019 4:37 PM. Updated:25th April, 2019 4:29 PM.